Lake Charles, LA – With most of the nation’s attention on Houston and Southeast Texas following Hurricane Harvey, Lake Charles, Louisiana as well as other cities in the state have seen a number of evacuees crossing state lines in search of a safe place to stay until the flood waters recede. Salvation Army officers, working alongside partner organizations, are helping care for hundreds in the shelter at the Lake Charles Civic Center. 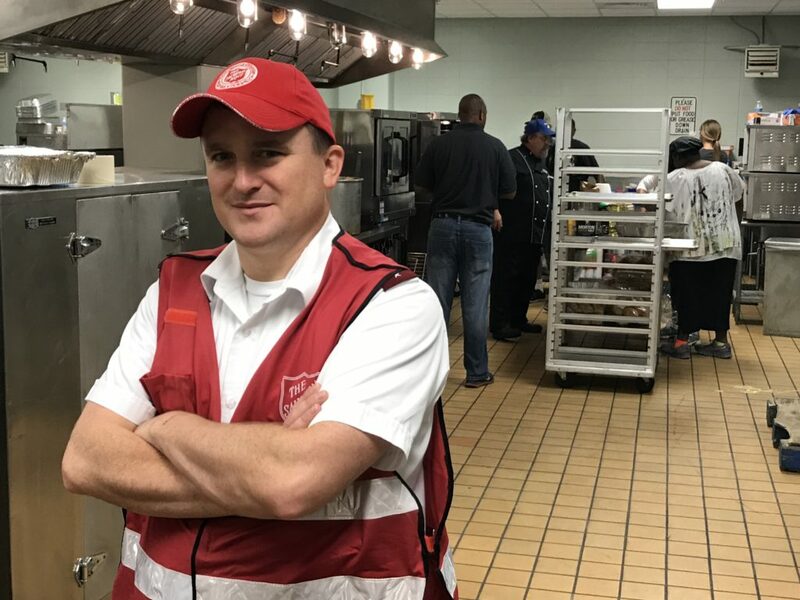 Lieutenant Watts, with the help of 80 volunteers, has managed meals three times a day for up to 1200 evacuees and residents driven from their homes by Harvey. Lieutenant Watts says it sounds like a daunting task, but the community has come together to make sure all those in need are helped. “We have rallied as a community, and you can’t ask for more than that,” said Lieutenant Watts. Lieutenant Watts also received a helping hand from Alexandria Corps Officer, Major Glenn Riggs, who provided emotional and spiritual care for the shelter. Major Riggs estimates he’s prayed and encouraged nearly 300 folks in this shelter. He says he’s spoken with some who have lost loved ones and their homes from the storm. “They are pleased with the care they’ve received here, and even with the uncertainty, in fairly good spirits,” said Major Riggs. More evacuees are expected in cities across Louisiana according to officials because flood gates will have to be opened to release the built-up water.